The first penny scales of the late 1880s offered a service rather than a product, setting them apart from the new and fast-growing vending machine market. Penny scales gave the public their first opportunity to weigh themselves without going to a doctor. Once corner landmarks, American penny scales were playful and fun and stood watch like sentries across the American landscape, reminding everyone to watch their weight and keep healthy. These “robots of trade” evoke nostalgia for simpler, healthier times, and have all but vanished from the urban landscape. Ingenuity was required to attract passersby. Enticements such as tickets with pictures of Hollywood movie stars, scrolls with horoscopes, games of chance, gum, candy and other clever gimmicks were employed—all without electricity. Twenty-first century scales provide new innovations. In Ireland, computer scales offer height, weight, body-mass index and blood pressure for two Euros. American penny scales stood watch like sentries across the American landscape reminding everyone to watch their weight and keep healthy. Pitched as trade stimulators; known as silent salesmen, these “robots of trade” evoke nostalgia for simpler, healthier times and have all but vanished from the American landscape. For nearly 50 years, penny scales were the most popular machines for monitoring weight. In their heyday, 1930s and 40s, these mechanical wonders brought in over 10 billion pennies or over $100 million annually. That’s equivalent to $1.5 billion. In the late 1880s, the first American penny scales made their way on to the scene to offer the public their first chance to monitor weight and health without visiting a doctor’s office. The penny scale distinguished itself from earlier vending machines that dispensed products such as gum or peanuts by their very lack of product. They offered a service not a product. This is how the penny scale earned the designation, America’s first vending service. Today there are many service-oriented, coin-operated machines in operation. Laundromats, car washes, and bowling ball polishers are just a few. It wasn’t long before the scale designers added products, as incentives. Along with innovative engineering, real ingenuity was required to attract passers-by and “turn pennies into gold. Electricity was rarely used. Inventors outdid each other coming up with gimmicks to entice people to drop in a penny – some scales told your fortune, some gave you pictures of movie stars, others gave your penny back if you guessed your weight or hit a mark. Beautiful designs also attracted people to these mechanical wonders. The scales of top designers John Gordon Rideout, Harold Van Doren and Joseph Sinel mirrored silhouettes of modern skyscrapers, and discreetly delivered the weight. Less modern scales relied heavily on large round dials that could easily seen by prying eyes from across a street. When penny scales first came onto the scene the cost for a loaf of bread was near a penny. While the cost of bread continued to rise, the cost to get weighed did not. The cost of the enticements like movie star tickets, horoscope cards increased foot traffic but cut into the profits and shortened the working lives of the machines that dispensed them. The scales that provided service only basically defied inflation for 60 years until by the early 1950s it simply became too expensive to pick up their pennies. Cash boxes grew in size to facilitate longer times between each service. This increased the chances a scale could be out of order when the vendor came around to collect the profits. An out-of-order sign might as well have said, “Rest in peace.” Sadly, these once proud machines, if broken down, often ended their days in service as coat racks. The national routes had to be sold off to local operators to stay profitable. This postponed the inevitable until the late sixties when the vendors had to increase the cost of a weigh to a nickel. Some of the public expressed their dislike of this change by literally taking it out on the scales. Up until this time the vandalizing of machines had not been a problem. The dime weigh was soon to follow and nobody seemed to care. Now we have 25 and 50 cent scales run by computers and the scales with the wonderful mechanisms are nearly gone. 21st century coin-operated weighing machines are being designed and manufactured today with their own special enticements. Currently there are new machines on the sidewalks of Dublin, Ireland that offer weight, height, body-mass-index and blood pressure readings all for 2 Euros. That’s nearly 300 times what a weigh cost 100 years ago. I see great potential with the scales of the future and I am an advocate for the return of the public weigh. The penny scale was the first vending service and offered the public the first opportunity to watch their weight without going to a doctor's office. For over 100 years, the coin-operated, public weighing machine winds its way through the history of vending. The biggest hurdle cleared by the vending industry occurred on April Fool’s Day, 1944. On this auspicious day, Congress passed a bill that made the use of a slug in place of a coin a federal crime. This opened the door for the dispensing of more expensive merchandising through a multitude of vending machines. One of the earliest patents I have found dealing with this challenge of the slug was granted to E.M.Perfect of Crafton, Pennsylvania. He was granted a patent September 18, 1917 for a mechanism that rejected imperfect tender. The object of his invention was to “provide an improved coin weighing mechanism for vending-machines, whereby “slugs” and coins of insufficient weight will be rejected and returned to the person who deposits them in the machine. The most insightful magazine article on this subject I've come across is in The Saturday Evening Post, November 1, 1930 issue. The article by Arch M. Andrews entitled Profit from Pennies, covers all aspects of the burgeoning penny-scale business. In the section entitled Fooling the Robots, Mr. Andrews writes, "Naturally, objects other than pennies are inserted in these machines. Spurious coins that would not fool the dullest sales clerk are shoved into these robots of trade. One of the advantages of the penny scales is that they do not attract the small boy who is looking for an outlet for a handful of washers plugged with tin foil, or tobacco tags, or other metallic disks that do not bear the stamp of the mint." In the section, under the heading, Chasing Four Billion Pennies, Mr. Andrews states, "Now an interesting fact about those business enterprises that rely on pennies as the chief tool of their operations is that they are poor or prosperous in accordance with the number in circulation. Consequently, during the period of nuisance war taxes, the scales and vending machines reaped a harvest richer than ever before." In 1930, one company collected five tons of pennies daily out of scales and various other penny vending machines in the New York subway system. Penny-vending machines were the principle way the government kept pennies in circulation. 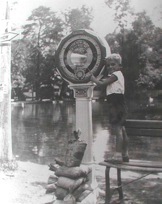 Nick Farr, pictured with a Watling Ambassador Scale. The bags, on the platform, hold $396 in pennies, weighing 275 lbs. That’s equivalent to $5,744 today. This bounty was collected from the all of the weighing machines of Williams Grove Amusement Park in Williams Grove, Pennsylvania, ca. 1937. The 25-cent charge has rejuvenated public weighing. Scales have been seen in Washington, D.C. charging 50 cents and the newer scales are equipped with switches that can be flipped to charge up to four quarters when a public weigh will cost a dollar.